Made in USA. Sioux Chief is committed to manufacturing in America. More than 95% of our sales come from products made in the USA. And we're resolved to keep it that way. It's a rarity for most companies these days - not for us. For Buy American Act and other initiatives, consider Sioux Chief as your source for American made commercial drainage products. Aesthetically Pleasing. People care about how finished products look - even for rough plumbing. So, when developing products such as our Finish Line™ series of commercial drains, we gave attractive strainers and finishes. More importantly, the patented adjustable coring sleeve design helps the contractor keep a perfect finish - after the pour. This means the contractor can adjust the strainer up and down to make a perfect on-grade finish, without boxing out, chipping up concrete or otherwise making a mess. Communications Center. 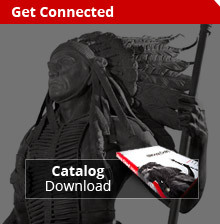 Sioux Chief has the tools you need to make your job easier- from specification guides to BIM. Explore our website or contact your representative to learn more about how to specify Sioux Chief.